Did you hear about that man from Delaware who broke and pocketed a thumb of one of the terracotta warriors on display in the Franklin Institute back in December? The theft understandably caused quite a stir in China that the Shaanxi Cultural Heritage Promotion Center, the organization that loaned the army sculptures, strongly condemned the Philadelphia museum for being "careless." A Communist Party-affiliated newspaper, Beijing Youth Daily, demanded severe punishment be given to the perpetrator. The thumb was eventually recovered, and two experts were sent to assess the damage and repair the statue. The man was arrested and charged in February, and is released on bail. If you're intrigued to learn more, you can read about it here. I actually wish I had known of this tidbit when we finally saw the exhibit in February. At the time of our visit, the terracotta (other acceptable spellings: terra cotta; terra-cotta) sculpture in question was still missing a thumb. The evening admission granted us access to the Terracotta Warriors exhibition, which cost $20 per person. My family of four are all on adult rates now, but those toting younger children aged between 3 and 11 got entry for their kids at $15 each. I wouldn't have mind paying $35 for each of us ($30 for children) to include general admission to the entire museum and made the most out of our drive to the city. It was our first time at the Franklin Institute - save for our son who had been years ago for his fourth grade field trip - and we would have loved to spend at least a couple of hours in the museum. I don't know if it was normal I-95 Saturday night congestion or it was just that many people were driving into the City of Brotherly Love that weekend, but the traffic almost threw our night at the museum plans away. Philadelphia hosted the Super Bowl the following day, so a lot of people were traveling to the city. Although the Franklin Institute has its own parking garage within the building, we had intended to park on one of the nearby streets as it is cheaper. However, since we were already pressed for time, we decided to park in the building. The damage for our two-hour stay was $18. (Click here to learn more about the Franklin Institute's parking rates.) I was just so happy that we made it. The Franklin Institute opens its doors for evening admissions at 5:00 p.m. Prior to entering the exhibit, we were welcomed by a narrated animation projected on makeshift walls that showcased a brief history on the rule of China's first emperor, Qin Shi Huang Di, the short-lived Qin dynasty, and his burial with these terracotta sculptures. Qin Shi Huang Di ruled from 246 to 210 B.C.E. and is credited to ending feudalism in China and unifying the country's warring kingdoms. Given that, he saw "king," the title that he and the other heads of kingdoms had all been previously referred to, unfit and thus self-invented the title "emperor." Despite the Qin dynasty being short - having lasted only 15 years and seen only two emperors - it is an important pivotal period in Chinese history as it inaugurated the country's imperial system, expanded the Chinese state and built the first edition of the Great Wall of China, among many other things. Like many world leaders throughout history, Qin Shi Huang Di was obsessed with immortality, and his achievements during his reign were just not enough legacy for him. He wanted to be memorialized that he ordered the construction of his mausoleum shorty after his rose to power. The tomb complex is a city unto itself and rightfully now a UNESCO World Heritage Site. 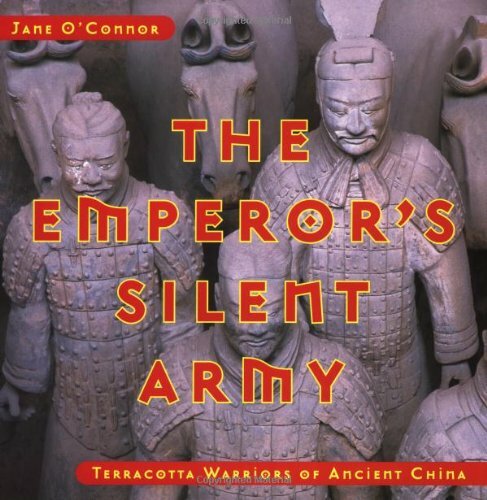 It consists of the Qin Shi Huang Di's tomb, thousands of terracotta warriors (arranged according to rank), weapons and wooden chariots drawn by clay horses. The terra (earth) cotta (baked/cooked) sculptures represent the armies of China's first emperor whose purpose was to protect him in the afterlife. After the animation, a door split open to reveal what I believe is a middle-ranked officer (please feel free to correct me if I'm wrong). The Franklin Institute offers audio equipment is available for $6, which you can either get when you purchase your tickets online or at the door. In retrospect, I wish I had gotten my family an audio equipment each so we didn't have to huddle over the printed texts next to the displays with the other museum visitors. It's particularly a challenge for me and I quickly saw myself in a major #shortgirlproblems kind of situation! The exhibit was hyped up to be interactive. 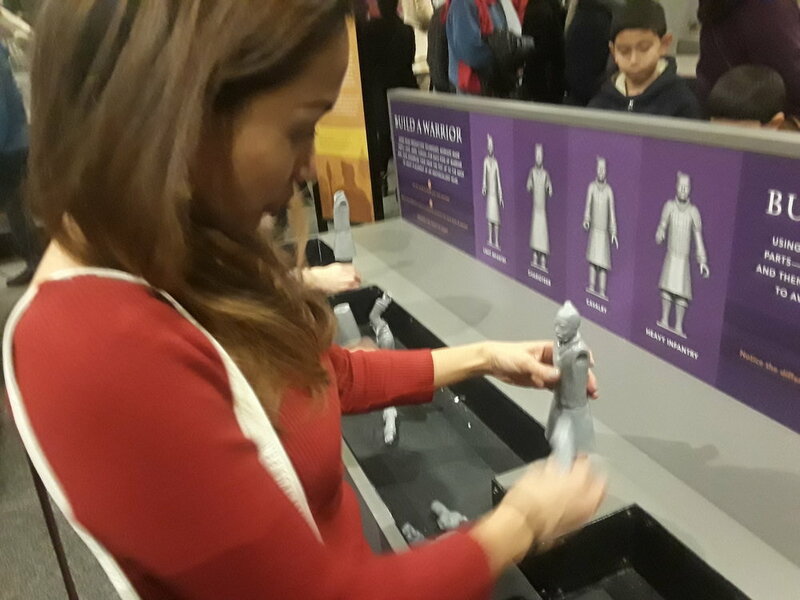 We got to assemble terracotta warriors using plastic figurines with detachable body parts. But what the museum wanted visitors to get excited about was the accompanying augmented reality (AR) experience through a mobile app. Available on both iOS and Android, my family and I had the app downloaded on our devices prior to our visit. Between taking photos, looking at the artifacts and reading snippets, fidgeting on my phone for the extra AR experience was a bit too much for me. My teenagers, however, enjoyed using it while going around the exhibit as the app allowed them to instantly share their captures with their AR creations on their social media accounts. Unfortunately, like most teens, they forget (or flat out don't care 😒) to save their Snapchat or Instagram stories, so I have no photos to show how the AR, uhm, augmented our experience. Don't play any tiny violins for me, though. The app has a feature that allows you to build your own mobile army, and you don't have to be in the museum to use it! I, of course, have been playing around with it. Check out our Get There Get Lost terracotta crew! 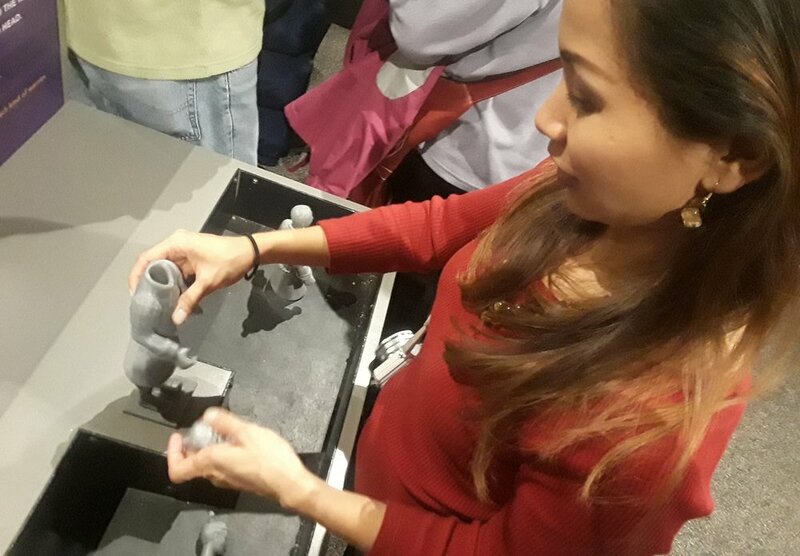 The Terracotta Warriors of the First Emperor at the Franklin Institute featured more than just the clay structures. Using a light projector, the exhibit reimagines the sculptures in different clothing as depicted with this warrior shown in the short clip below. Only 10 terracotta warriors were loaned by the Shaanxi Cultural Heritage Promotion Center to the Franklin Institute. However, they came with over 170 artifacts, including gold and jade pieces, and bronze chariot replicas. The whole display occupied a relatively small space in the museum that the average history aficionado visitor with the audio equipment and doesn't take a lot of photos could have completed it in two hours or less. I was a little disappointed at first, to be honest, but when I learned that this is the first time in 30 years that these structures are back stateside, and that 30 years ago, the US were only loaned three terracotta warriors, I became more appreciative of the experience. Philadelphia is actually one of two cities and the only one on the east coast that were granted this loan, the other city being Seattle. I consider myself lucky to have been able to see these archaeological gem without going too far! I will be creating an album of this family night at the museum on Facebook soon, so stay tuned!